Harvey Milk: How do you teach homosexuality? Is it like French? It was difficult for me to stand up after seeing Gus Van Sant’s masterful MILK. The lights had already come on so my puffy eyes could be hid no longer but I had forgotten how to move. I was too engulfed with sadness and dismay. All I could think about was how far we think we’ve come as a supposed progressive people. 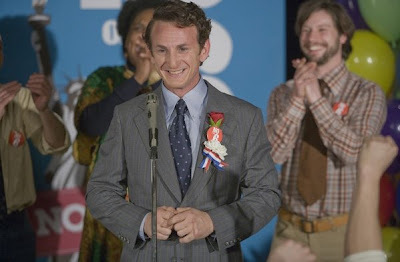 Harvey Milk, the man whose story Van Sant is telling, was elected into public office in the late ‘70’s in San Francisco. He was the first openly gay man to be elected to any significant level of government in American history. He was also shot and killed after being in office for less than a year. His last major political accomplishment was successfully campaigning to defeat a bill called Proposition 6. This bill would call for the dismissal of all openly gay school teachers and any persons who supported them. The bill had already passed in a number of other states and fear was mounting that even the country’s most gay-friendly city might follow suit. Harvey wouldn’t have it and ultimately, neither would San Francisco, or all of California for that matter. Why then are gay men and women still struggling to be treated like human beings to this day? 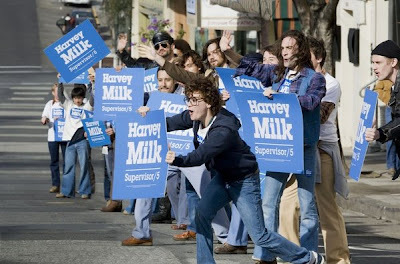 MILK picks up Harvey Milk’s life in the eight years preceeding his assassination. In that time, he meets a man who would become his lover for many years; he moves from New York to San Francisco to find new challenges; and he runs a number of times for public office as an out and proud gay man. He also loses a number of times but Milk was not a man who could easily be deterred from his very important goal. It was Milk’s mission to represent his people; to show the city he loved that the gay population was one of the reasons that the city itself was so well loved by all who visited and that they too had a powerful and reasonable voice. Milk was committed to making sure that voice was heard. Van Sant, an openly gay man himself, is just as committed to the cause but his part is very different. Even today, the image of the gay man is still being sold to mainstream audiences, or straight if you will, in a delicate way. Van Sant’s Milk is an ambitious entrepreneur. He has a strong character, funny and flighty one moment, romantic and intimate the next and always dedicated to the bigger picture outside of himself. Apparently, painting the gay man as human is still necessary because many still haven’t figured it out for themselves. Of course, Van Sant can’t get all the credit as he is only as strong as his parts. In this case, his parts are all perfect. Big Love staff writer, Dustin Lance Black’s sensitive screenplay is heartbreaking and genuine. Director of photography, Harris Savides, who has brought a dreamlike lucidity to Van Sant twice before on GERRY and ELEPHANT, goes back and forth between archival and new footage seamlessly planting the viewer in both the historical context and the surrounding human drama. Danny Elfman fills the soft space with a score so layered, it can easily be described as his most original work in recent memory. And then of course, there are the men. I will never describe a straight man playing a gay role as an act of bravery. I will, however, always applaud an actor’s ability to shed their entire ego and transform into another being so fearlessly. The caliber of the mostly male ensemble cast of MILK seems raised by a desire to do justice to this important man and the difference he made. 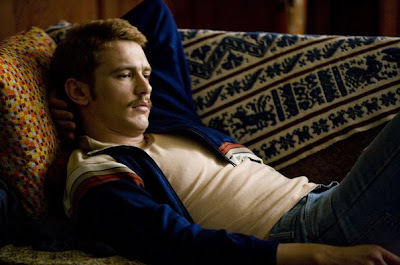 James Franco as Milk’s longtime lover continues to show versatility that I never expected by embodying support and strength. Josh Brolin, as the fellow city supervisor who ultimately kills Milk, gives a ferociously internal performance that is in constant turmoil. And though I have never been as huge a Sean Penn fan as most would appear to be, I am a devout admirer now. Penn’s performance is a rarely achieved transformation – one so believable and so gripping that it lifts the entire film to new levels of excellence and inspiration. 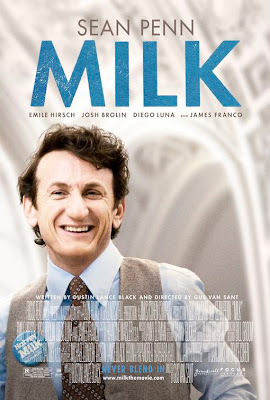 MILK is not only a Gus Van Sant career high but also an instant American film classic and a contemporary gay film masterpiece that, like the revelatory BROKEBACK MOUNTAIN, transcends the gay experience and steps firmly into the human experience. If only for that reason alone, MILK has the potential to be more than a film and be part of a movement. After all, if there is one thing that Harvey Milk fought so hard for, for so long, it was to be seen as a man who deserves the same human rights as his neighbours. Thirty years after his death, the fight he fought is still ongoing and thanks to Van Sant, Harvey Milk is back to help make sure it finally gets won. How many sheep would you give Milk?